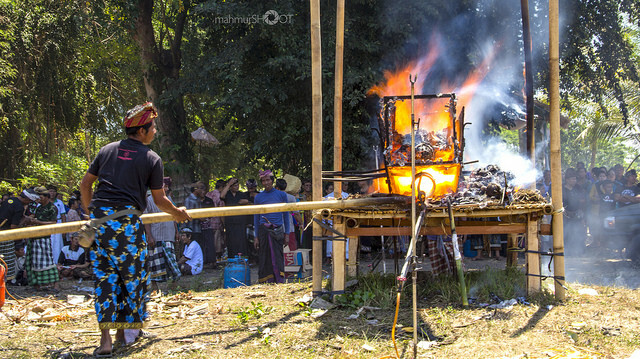 The Ngaben Ceremony is generally defined as the cremation rites. Etymologically , it could be false one, because there is a tradition of cremation is not through cremation. Ngaben indeed comes from the word meaning beya(cost) or provision, said beya in active sentences (an activity progress) becomes meyanin. The word meyanin has become the common word to mention ceremony sawa wadhana. May also be called Ngabeyain. The word is pronounced with a short, later becoming a cremation. Sawa Wedana is ceremony ngaben involving bodies that are still intact (no buried in advance). This ceremony is usually conducted within 3-7 days calculated from the day of death of the person. The exception is common at a ceremony with the major scale, that his preparation could take up to a month. While the family preparing everything for the ceremony so the bodies will be placed in the existing Customs Hall at each home by administering a particular herb to slow decay of the corpse. Today the awarding of the herb is often replaced with the use of formalin. During the funerals are still placed in the Customs Hall, the family still treats his body like that should still live, such as entailed a coffee, feed the beside the corpse, bringing towels and clothes, etc. because before the ceremony called Papegatan then the question was considered only sleep and still be his family surroundings. Mendhem Sawa means burial of corpses. In the face of the inexplicable that the cremation in Bali is still given the chance to temporarily put on hold, citing various things as has been outlined. But beyond that there is still a philosophical reason again, which in the paper ejection are not yet found. This reason may just be written that is associated with the Foundation or philosophical background of life. The reason is so that the sarira ragha is derived from elements of the prthiwi while ducking on prthiwi may be used to. Who is depicted ethis so they can kiss my mother prthiwi. But be reminded that in principle every person should die soon in aben. For those who still need time to wait while then sawa (deceased) it must be at pendhem (buried). Deposited on the goddess penghuluning Setra (Goddess Durga). Mitra Yadnya comes from the word Pitra and Yajna. Pitra means ancestor, yajna means Holy sacrifice. The term is used to name the type of cremation is being taught on Lontar Yama Purwana Tattwa, because unnamed certainty. Cremation according to Yama epigraph Purwana said Tattwa is the word Lord Yama. In warah warah-it does not mention the name of the type of cremation. To differentiate with other types of cremation sedehana, then cremation is named partner of the Yajna. Implementation of the Atiwa-atiwa/cremation set out according to the provisions in the Yama Purwana Tattwa, especially regarding the upakara and implemented in seven days by not picking up (good day). Pranawa Pranawa is revised Om Kara. Is the name of a type of sacred letters utilizing cremation as a symbol of sawa. Where on the bodies that had been buried three days before pengabenan was held the ceremony of Ngeplugin or Ngulapin. Pejati and pengulapan in Jaba Pura Dalem by means of bebanten to pejati. When the day of pengabenan and its bones are United on jemek pemasmian. His bones under jemeknya above. Then apply the provisions such as new amranawa sawa died. Ngasti to send the same also with the provisions of amranawa sawa cremation recently died, as has been outlined. Pranawa Bhuanakosa is the teachings of the God Brahma to Rsi Brghu. Where Cremation Sawa Bhuanakosa for people who recently died, though he was never planted, disetra. If you want to mengupakarai as path with Prana Bhuanakosa Wa. Swasta means private disappeared or missing. Is the name of a type of cremation sawanya (his body) No (tan kneng hinulatan), cannot be seen, died in the distance, long on setra, and others, can all be done with private types of cremation. Although the contemptible, and uttama (sarira) as the body of the dead symbolized by Dyun (crock) as the skin, thread 12 iler as muscle, the water as meat, balung(wood) of cendana 18 pieces. Pranawa as sound, ambengan (straw) as mind, Recafana as veins, ongkara as living lingga. Three days before the ceremony pengabenan ngulapin, for those who died in the distance the unknown place, where the ceremony of pengulapan, can be done diperempatan the road. And for a long time in pendhem that can not be known mark pengulapan can be done in Jaba Pura Dalem. Ngulapin, Ngulapin meaning as the ceremony to call The Atman. The ceremony was also held in question died outside the home in question(for example in hospitals, etc.). The ceremony is carried out differently in accordance with the Ordinances and local tradition, anyone carrying out at the intersection, the fork in the road, and the local cemetery. Nyiramin/Ngemandusin, is a ceremonial bathing and cleaning the corpse, the ceremony is done in the home yard (natah). In this procession is also accompanied by the granting of the symbols like jasmine flowers in the nasal cavity, glass hemisphere above the eyes, leaves intaran in the eyebrows, and other appliances with the aim of restoring back the functions of the parts of the body is not used to its origin, as well as in the spirit of late experienced reincarnation was back in for a full body (not disabled). Ngajum Kajang, kajang is a white piece of paper inscribed with a magical alphabet by priests, pastors or elders of the local customs. After completed the relatives and descendants of those concerned will carry out the ceremony ngajum kajang by pressing 3 x as much as it was, kajang as a symbol of not only the hearts of the relatives took off late departure and unite the hearts of the deceased so that relatives can quickly do to nature. Ngaskara means of cleansing the spirit of late. This cleansing is done with the goal of keeping the spirit in question can be United with God and can become the supervisor of her relatives who still live in the world. Mameras, Mameras comes from the word peras meaning work, success, or completed. The ceremony was held in the late already had grandchildren, because according to the belief that the grandchildren who will lead the course of late through prayer and the good karma they do. Papegatan, Papegatan comes from the word pegat, meaning, the meaning of this ceremony is to sever the relationship and love of earthly relatives late, because both of these will impede the journey of the spirit toward God. This ceremony means the family have been sincere to take off late departure to a better place. The means of this ceremony is the offerings (banten) arranged in a stone mortar and above filled in two branches of the tree Erythrina Variegata formed as the goal and laid on a white thread on the second branch of the tree. Later, this thread will passed by relatives and pallbearers before exiting the House to break it up. Pakiriman Ngutang, papegatan after the ceremony will be followed by pakiriminan to local cemeteries, funerals along with kajangnya then offered up to the top of the Bade/place to put kajang, the pallbearers (this is not an absolute must exist, can be replaced with simple keranda(place to put corpse) called Pepaga). 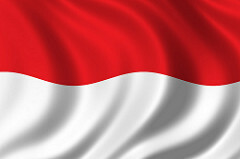 The members of the House concerned members of the public will be carrying all the supplies the ceremony along with the bodies accompanied by the sound of Baleganjur (typical Balinese gong) that continously played and excited, or the sound of angklung is impressed sad. On the journey towards the grave of this cadaver will be paraded spin 3 times counterclockwise meaning as a symbol of restoring Panca Maha Bhutas into place respectively. In addition it also means turn around: Turning 3 x in front of the home of revered as a symbol of separation with relatives. Spin 3 x in the intersection and fork in the village as a symbol of separation with the environmental community. Spin 3 x in the face of the grave as a symbol of farewell to this world. Ngeseng, Ngeseng is a ceremonial burning of the cadaver, corpse was laid in place that have been provided, accompanied by offerings and Banten with the philosophical meaning of its own, then watered by the priest who officiate with Pangentas Tirta which acts as an abstract flame accompanied by Puja Mantra of Pendita, afterward burnt to charred corpses, bones as the results burning then crashed and assembled again in kelapa gading(coconut gading) that has been issued. Nganyud, Nganyud meaning as rituals to drowning all the filth that is left in the spirit of late with symbolizing either a corpse ash was washed away. The ceremony is typically implemented at sea, or the river. Makelud, Makelud usually implemented 12 days after the burning of bodies. The meaning of this makelud ceremony was clean and cleanse the family environment due to the grief. Philosophically, 12 days of grief is taken from the Hindu epic Mahabharata, when The Pandavas through punishment of 12 years in the middle of the forest. 0 Response to "Ngaben The Return of Panca Mahabuta"